JOIN THE TRF CAR CLUB! Receive Amazing Benefits! — Save Money on Parts Purchases! Support the British Car Hobby! — Enjoy Club Membership! 1. Ten percent discount on parts purchases. Offer not valid on Sale Prices or on "non-discountable" parts with prices ending in ".00". 2. Receive a $25.00 Coupon every month—good as cash on any order valued at 75.00 or more. 3. Receive a special monthly offer in addition to the above benefits. 4. Membship card and tool box sticker. 5. Right to purchase club regalia, including T–shirts, sweatshirts, baseball caps, mugs, car badges and patches. Why advertise some clothing designer when you can have a real club affiliation with something you believe in? 6. And, you get this year's dues back in the form of a parts credit from The Roadster Factory when you renew your membership next year. You receive all of the above and much more when you join The TRF Car Club. Dues are $100.00 per year. Please print the Membership Registration Form and send it to us by mail, or by fax today. You can join TRF Car Club by using this link or call 1-800-234-1104. Free Peanuts With Your Parts Order Of $200.00 Or More. 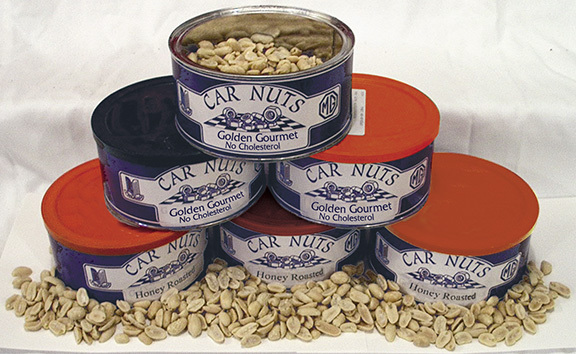 Please mention that you are getting the Free Car Nuts in the comments field when you place your online order, or tell your salesperson on the phone. Send your email address to :trfpublications@aol.com to sign up. The Roadster Factory is the premier British sports car company in North America because it has always been run, more or less, as a club of enthusiasts who know that a classic British sports car is an essential accessory for their way of life. The life dates to World War II when U.S. servicemen saw pre–war MG's parked outside RAF airfields while their owners flew Spitfire fighter planes in deadly combat against a foreign enemy that would invade their green and peaceful homeland. This romantic image translated into the 1950's and 1960's when many of The Roadster Factory's customers came of age in America. American G.I. 's had brought the MG's and Triumphs home from England after the war, and they had transported the associated lifestyle to American race tracks and to American college campuses. A British sports car was an automobile that you could drive to work all week and then take racing on the weekends, and this was done in many parts of the U.S. throughout the 1950's and 1960's in places like Southern California, Long Island, New York, New England, The Southeast, and the Southwest. What a wonderful time to live! This writer remembers collge in the 1960's. A small town with white–painted houses and tree-lined streets. TR3's and MGA's parked outside a place called Lefty Raymond's College Inn. Sorority girls in plaid kilts and knee socks. Guys wore Bass Weejuns, blue jeans, khaki pants, Gant shirts, and Baracuta jackets then. Do you remember Clark's desert boots? Many of us dated and married the long–haired girls who wore those plaid skirts with shetland sweaters when they rode in our noisey cars with the leather seats on the seemingly endless golden autumn afternoons of our youth. Do you remember those days with their blue skies full of fluffy clouds and their long frosty evenings when you had better things to do than to study for a physics test? Did you have a sports car then? This writer did not, but I yearned for one as I rode with my friends. Eventually, I found a very rusty TR3 that I could afford, and it was everything I knew it would be as I drove it through the mountains of springtime on my way to work at my first job. If you've read this far, you should support The Roadster Factory, join The TRF Car Club. The Roadster Factory has been "keeping the faith" with Triumph and MG sports cars for over twenty years, and we welcome you to join us. You don't have to join the club to buy your parts from The Roadster Factory, but joining the club will help The Roadster Factory to carry on its work of promoting the British car hobby and of maintaining the supply of critical parts.